To reap the full benefits of cloud computing, the IT infrastructure must run efficiently. Many organizations, however, are operating an IT infrastructure that has been cobbled together over time and is based on disparate technologies that often are aging, labor intensive to maintain, and difficult to adapt to changing workloads. Upgrading the IT infrastructure to support the latest cloud computing technologies can be a big undertaking. To reap the benefits of the cloud, IT infrastructures must run efficiently and provide the flexibility to dynamically adapt to changing user workloads. The Oracle Optimized Solution for Enterprise Cloud Infrastructure on SPARC greatly simplifies the task of building out an enterprise cloud infrastructure that can deliver on the promise of the cloud. 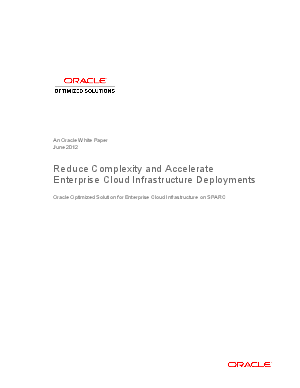 Download this whitepaper and learn how to reduce complexity and accelerate enterprise cloud infrastructure deployments.